Bus from Ipoh to Lumut is one of the popular bus services in Ipoh Aman Jaya Bus Terminal. Many locals rely on this service to travel between Ipoh and Lumut. Besides that, Lumut as the gateway town to Pangkor Island, many tourists take bus from Ipoh to Lumut for transferring ferry to Pangkor Island. Perak Transit and Kesatuan Express are the two companies serving bus from Ipoh to Lumut. The first bus starts as early as 09:30 and the last bus is at 0115 midnight. In between, there are numbers of schedules to serve passenger to Lumut. 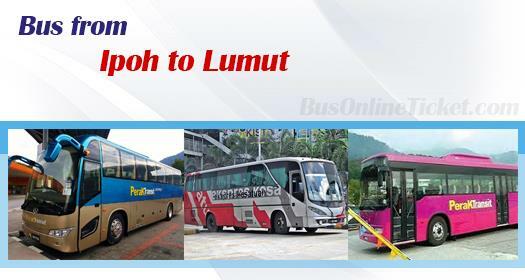 The fare for bus from Ipoh to Lumut is in the range of RM 7.70 – RM 12.00 per ticket. The travel duration for bus from Ipoh to Lumut takes about 2 hours depending on traffic condition. Coach will usually travel directly from terminal to terminal without stopover, unless there is request from passenger for washroom break. Aman Jaya Bus Terminal is the departure point for bus from Ipoh to Lumut after closure of Medan Gopeng Bus Terminal. The arrival point in Lumut is at Lumut Bus Terminal, which is just opposite to Lumut Jetty. Passengers going to Pangkor Island could just cross the road to Lumut Jetty for ferry boarding. BusOnlineTicket.com is one-stop portal providing online booking for bus ticket with instant confirmation. Online payment can be done with either credit card or internet banking. For those with connecting ferry service to Pangkor Island, it is better to book in advance to avoid missing the ferry.